Although it’s hard to tell much about the new song from distorted audience videos, Missy looks exuberant, wearing giant hoop earrings and a pink, sparkly tracksuit. Thought to be titled “Triple Threat,” the track reportedly pays its respects to the late UGK great Pimp C, and it’s the same one Timbaland previously showcased at SXSW. 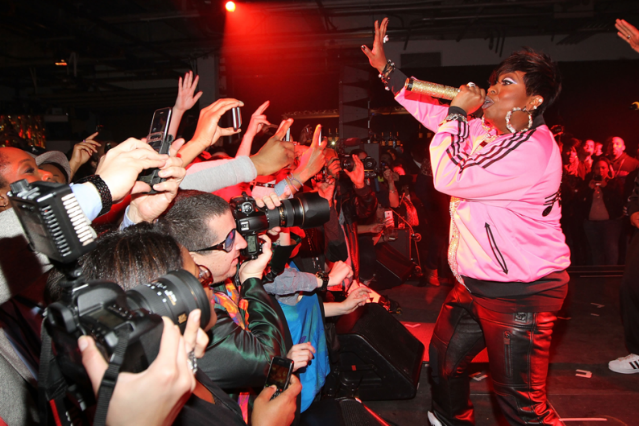 Missy didn’t make it to Austin, but her performance last night came as part of an event for Hennessy’s new “Wild Rabbit” brand. Missy has had an emotional year or so, from revealing her diagnosis with an autoimmune disorder called Graves’ disease to opening up about her heartbreaking childhood on VH1’s Behind the Music. But while female rappers might not be such a rarity these days, as Nicki Minaj celebrates the release of Pink Friday: Roman Reloaded and the likes of Azealia Banks continue to break out, there’s no one quite like Missy. In 2010, Missy’s 1998 LP Supa Dupa Fly placed at No. 85 on SPIN’s Top 125 Albums of the Past 25 Years. To find out more, be sure to check out our pre-Supa Dupa profile on Missy “Misdemeanor” Elliott in the October 1997 issue.